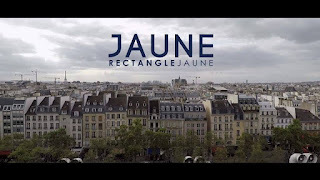 I was one of the people who were extremely supportive when Rectangle Jaune rebranded into Jaune (Less is more). The act marked a rejuvenation for the brand, led it into a more "nordic" approach as opposed to the maritime elements of yesteryear Tommy Hilfiger, and set it on a minimalist tone compatible with the aspirations of a younger generation. Alongside Jaune though, Rectangle Jaune still existed in the shape of an outlet to liquidate its former stock - the decision seemed a little odd as the brand Rectangle Jaune should have been dead and buried. Not only this, but this year's advertising comes with the shocking signature "Jaune" and underneath it a clear "Rectangle Jaune". If this makes any sense in terms of marketing then please someone explain it to me - as it is - I am not sure it registers in my lexicon. If the idea is to revive Rectangle Jaune a couple of seasons later, then why rebrand in the first place. If Jaune is a sub brand of Rectangle Jaune, then why bother launch it as a rebrand with big fanfare. No matter how one flips it there is no logic in this marketing move. Sure, their film on the Paris roofs is a joy to see, but frankly, I am failing to understand what to call that company any longer!